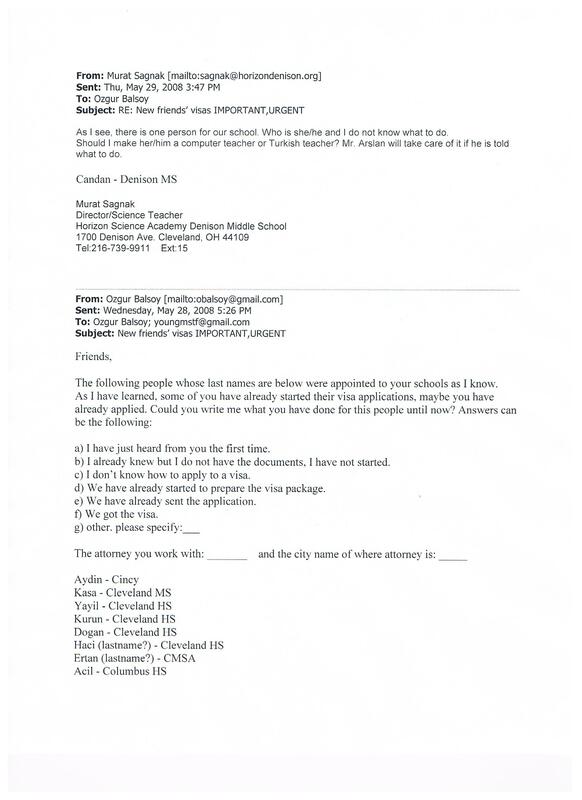 Friends and Visas - CHARTER SCHOOL WATCHDOG http://www.charterschoolwatchdog. 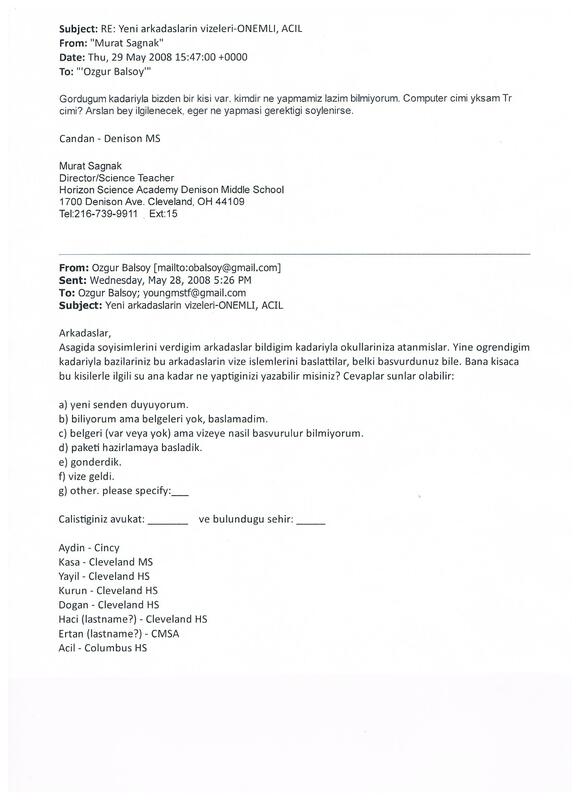 In this email, dated May 29, 2008, the boys, Sagnak and Balsoy are trying to figure out how to get a handle on the influx of new Turkish immigrants (or “Friends” as they are referred to), that are being slotted for positions in the various Horizon/Concept run schools in Ohio, Indiana, and Illinois. The boys have put together a sample “question and answer” survey to help expedite the HIB visa process for the incoming “can’t find an American teacher to fill these spots,” Turkish teachers. Note how Balsoy doesn’t even know the last names of some of these “highly specialized” “teachers,” and yet, they all seem to already have a “home school” to go to before they even land in the United States. Now we have to believe that the boys could have better spent their time and our tax money looking for credentialed and licensed American teachers, especially, as we have stated so many times in other blogs, the unemployment rate was inching towards 8% in 2008 when the boys were scrambling to get the Turkish employees visas to fill American jobs. We have often stated that the boys always knew well in advance which Turkish “teachers” would be brought over, despite their assertions to the contrary. Unlike the American teachers that worked for their schools and had to wait around until late May or early June to find out whether or not their contracts would be renewed, the perspective and existing Turkish teachers always knew where they would land by the end of April or early May. And how about Sagnak’s dilemma about whether to make “Candan” a computer teacher or Turkish teacher (because there is apparently a shortage of both)? H: How many of the visa applicants have teaching experience? I: How many of the visa applicants have a teaching license? J: How many of the visa applicants can actually read, speak, and write English? K: How many of the visa applicants found their way to the United States via Gulen’s cult? L: How many of the visa applicants paid for their visa fees out of their own pockets? M: How many of the visa applicants knew in advance that they would be paying a substantial portion of their salaries (up to 40%) back to Gulen and Hizment via the Tuzuk? Now those are the real questions – questions that lots of unemployed American teachers taxpayers would love to have the answers to. 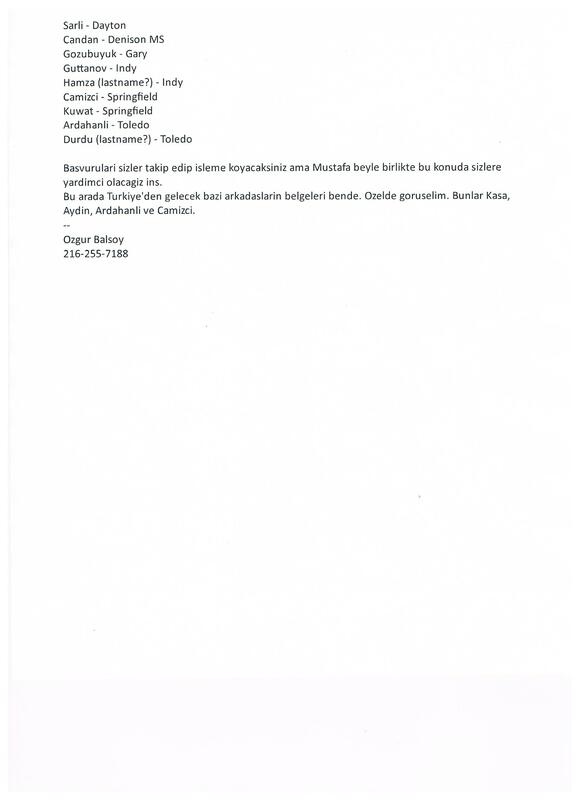 Below are the original Turkish emails and the English translations.